During the boom years employment in Perris hinged on construction and home sales. These days 47% of the area's homeowners are underwater on their mortgages. Perris could be described these days as ground zero for Southern California's economic recession. The Riverside County city, home to nearly 70,000 people, was once one of the fastest growing communities in the state. A video on its website boasts "Paris, France may be the city of light but Perris, California is the city of life." Now its unemployment rate is the highest in California. While the Inland Empire is averaging unemployment rates of around 13%, Perris' jobless figures are a staggering 20%. George Preciado, who has lived in Perris all his life and worked as a fast food manager, has been looking for work for a six months with no luck. "I keep applying and applying and I can't get a job." Resident Laurie Mantwell, 50, owned a maid service that employed 25 people. Her business failed last year. "We took a huge loss on our business," she said. adding that she had the business for nearly 20 years. She said she lost close to $150,000 before shuting down. Her husband works for the government and she fears he may be cutback because the city is trying to downsize. They are underwater on their home to the tune of $100,000: they owe $365,000 on a home that is only worth $222,000. Dee Dee Bazan, 43, lost her job in the healthcare industry in October. "I don't have a job right now, so yeah, the economy is bad in this area," she said. Bazan recently got her bachelors degree in health care administration but this hasn't helped her locate a new job. She is behind on her rent and four months ago, her unemployment insurance was cut and now, she has a tough time paying for food and gas, she said. From 2004 to 2007, Perris was a bonafide boomtown, new homes swiftly sprouting on affordable land. From the 2000 to 2010 census, the population of Perris nearly doubled, according to the Census. "There was a whole bunch of businesses and people were getting jobs." Preciado said. "I had a stable job and didn't have to worry about getting laid off." Whatever place is at the cutting edge of Southern California's growth at the moment of economic downturn is going to get clobbered, said John Husing, an econonomic analyst who specializes in the Inland Empire. Residents rushed to the Inland Empire because they could afford the houses. "And bam! It stops with the housing crisis," he said. 'And you have a catastrophe on your hands because you've lost wealth as well as you've lost jobs." Jose Marin grew up in Perris and is now a real estate agent. Folks selling their homes now are distressed sellers, he said. A house that was bought for $500,000 a few years ago, he said, is now on the market for $182,700. 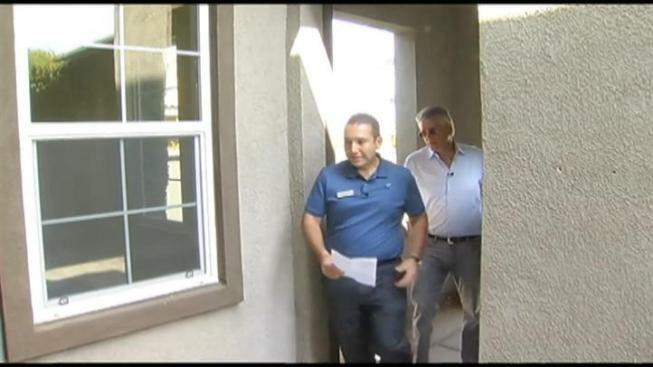 Homebuyers can now come to Perris from Los Angeles County and save about $150,000 on middle priced house, Husing said. But there aren't many prospective buyers. "People are afraid now," he said. Husing and other experts still see some reason for optimism rather than fear for homebuyers, home sellers and job seekers. "What's going to happen is that we've got about three to four more years until the housing crisis gets through the system and the correction is over," Husing said. His advice: "What you need is to try and do any strategy you can to hold on." Back to Work: This story is one in a weeklong series focusing on jobs and employment in Southern California.